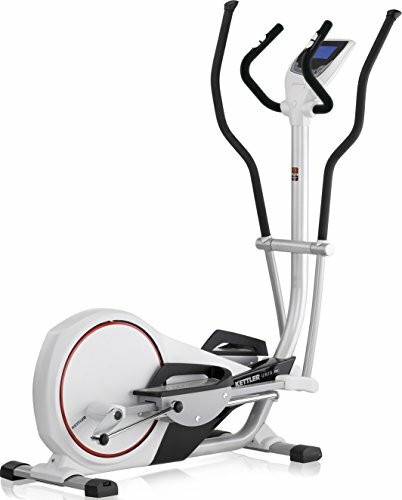 The KETTLER Unix PX Elliptical Trainer provides exceptionally smooth performance while delivering a great workout. Its frictionless, motorized magnetic brake system provides a range of resistance options, while a 45-pound flywheel ensures extremely smooth performance. Choose from 8 programs with adjustable intensity levels, including heart rate controlled programming. The 3 color, back-lit LCD high resolution computer display shows Total distance, Time, Speed, RPM, Energy Consumption and Heart Rate and also graphic dot matrix hill profiles using easy to read digital and graphical data. Heart rate readings are measured with an infrared heart rate earlobe clip sensor, by holding the telemetric hand grips, or with optional wireless chest strap transmitter. Recovery feature will provide grading of one's cardio wellness over time. The computer also tilts to avoid glare and includes a scan function enabling it to rotate the workout information to a larger digital readout in center of the screen. The Unix PX offers EXT Technology with a 19-inch stride length and 3 adjustable foot plate positions, providing optimal versatility in a compact amount of space. Built-in transport castors make relocating easy. An AC power source (110-120 volt) is required. German made and built to last, the KETTLER Unix PX Elliptical Trainer is an excellent choice for those seeking intuitive operation, challenging workouts and excellent performance. If you have any questions about this product by Kettler, contact us by completing and submitting the form below. If you are looking for a specif part number, please include it with your message.